In this its 14th season, Class Act Productions seems to just keep getting better. 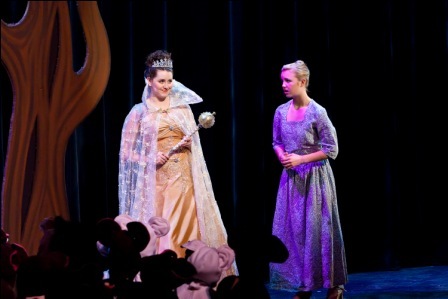 That impression was reinforced by my delightful visit to the group’s production of CINDERELLA last weekend. With music by Richard Rodgers and book & lyrics by Oscar Hammerstein, this edition was produced by Class Act founder, Keith Brumfield and directed by Larry Smiglewski. 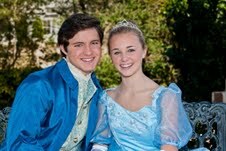 The show was not only artistically gorgeous to see and hear, but it also showcased two of the most remarkable young talents in Montgomery County: handsome Aaron Boudreaux as Prince Christopher, and the very lovely Jenny Gee as Cinderella. With Musical Director, Rae Moses conducting the Cinderella Orchestra, the immediate sweetness of the show’s lovely Overture wrapped its arms around young and old in an audience full of anticipation. Countless young girls in the crowd had come dressed as princesses for this special occasion, and they would be rewarded during Intermission with participation in a parade across the stage. I had seen this charming show twice before, once at Galveston’s 1894 Opera House, and once in an elegant Crighton Theatre production that actually had a horse-drawn carriage take Cinderella from the Opening Night performance to a private after-party that was delightful. This Class Act edition was an opulent gem right from Scene One with its charming village set (designer Nicholas Morgenstern), and the glorious Technicolor costumes of the townsfolk, designed by Judy Cook and longtime Class Act costumer, Caroline Zirilli. (Sadly, Ms. Zirilli is now leaving the company in a move to Connecticut. Her brilliant designs will be greatly missed). In that same opening scene we are immediately transported to the best of Broadway, for I tell you that Miss Gee and Mr. Boudreaux sang, “The Sweetest Sounds” so beautifully that they could have given this performance on any stage. It sends chills down the spine to see such perfection. They are truly remarkable in the warmth of their acting, and even more notably in the rich purity of their singing. Throughout the performance they were beautifully complemented by the exceptional choral excellence of the Class Act choral ensemble of this huge cast of talented youngsters. It was astonishing to see such professional skill in a local production. Our co-stars did not accomplish this success alone. Catherine Zirilli, with resonant voice and tongue in cheek, was an amusing sly fox of a Fairy God Mother as she sang the lilting and lighthearted, “Impossible.” In a glitzy fairy gown, she arrived in a magical mist with wand at the ready to help Cinderella by transforming mice into horses and pumpkin into coach under a very starry sky. (That magic was managed very well by the technical direction of Mr. Morgenstern and the lighting designs of Blake Minor). 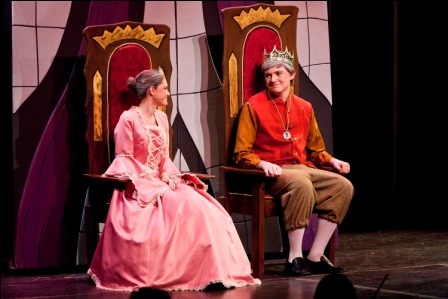 George Downham and Chloe Cook bring a sweet relationship to their roles as the King and Queen who long to find their son a wife, and their song, “Boys and Girls Like You and Me” was darling. 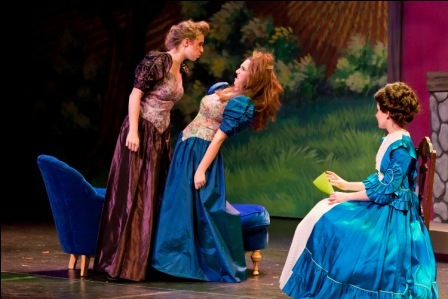 Julie Lewis is the haughty stepmother, with Chandler Harvey and Morgan Routh as the cruel and screwy stepsisters, and they play the comedy to the limit and beyond. They are scene-stealers all. The sisters were so over-the-top with their wicked and cackling nonsense that there were times when their shenanigans made it difficult to hear what they were saying, but ultimately they were a hilarious trio and the audience loved it. Speaking of hilarity, thanks to the witty script there was plenty of hilarity from Will Rogers in his cleverly comical performance as Lionel, the royal steward. 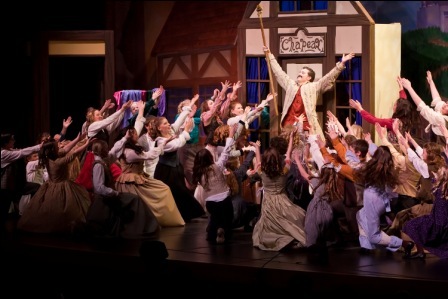 Sweet Abbey Schroder plays young Cinderella as a child in the seldom seen Prologue, and throughout the play, countless other talented youngsters play villagers, animals and guests at the beautifully staged royal ball. But some singers without the dangerous body microphones could not be clearly heard over the crowd. I say “dangerous” because those units have a history of failing at inopportune times, as was the case on several occasions during this performance. I would repeat my previous suggestion that Class Act consult with the sound engineers at John Cooper School where I have yet to see a similar problem in their large-scale productions. Let me return to the exquisite music that included the sweet delicacy of “In My Own Little Corner,” from Miss Gee, who moved about the stage with a seemingly effortless and natural grace as her adorable animal friends gathered around her. 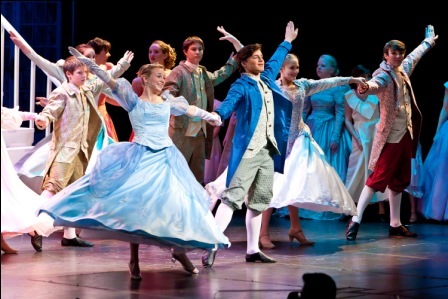 As for the aforementioned ballroom scene that began Act Two, it featured a regal atmosphere with its grand staircase, elegant costumes, and the charming “Gavotte” dancing of the ensemble as the prince endures moments on the dance floor with each eligible maiden. Boudreaux brings a great sense of longing to “The Loneliness of Evening.” But the right girl finally arrives as they and the guests dance the lovely, “Cinderella Waltz” under dreamy pastel lighting. For still more pure musical richness we have the sheer joy of the couple’s “Do I Love You Because You’re Beautiful?” duet. Back at the house, after her midnight rush from the palace, Cinderella joins Stepmother and stepsisters for the spirited quartet of “A Lovely Night.” But loveliest of all was the wedding finale with Cinderella in her exquisite gown as the Fairy Godmother led the full company in the optimistic song, “It’s Possible.” As the song says, “Impossible things are happening every day!” That is certainly true in the case of Class Act. CLASS ACT is preparing “Les Miserables,” for performances July 15th-24th. Visit the website at www.ClassActProductions.org . This entry was posted in Miscellaneous Reviews, Theater Reviews. Bookmark the permalink.